Pearl's job is to make people happy. Every day, she provides customers with personalized recommendations for greater contentment. She's good at her job, her office manager tells her, successful. But how does one measure an emotion?Meanwhile, there's Pearl's teenage son, Rhett. A sensitive kid who has forged an unconventional path through adolescence, Rhett seems to find greater satisfaction in being unhappy. The very rejection of joy is his own kind of "pursuit of happiness." As his mother, Pearl wants nothing more than to help Rhett—but is it for his sake or for hers? Certainly it would make Pearl happier. Regardless, her son is one person whose emotional life does not fall under the parameters of her job—not as happiness technician, and not as mother, either.Told from an alternating cast of endearing characters from within Pearl and Rhett's world, Tell the Machine Goodnight delivers a smartly moving and entertaining story about relationships and the ways that they can most surprise and define us. Along the way, Katie Williams playfully illuminates our national obsession with positive psychology, our reliance on quick fixes and technology. What happens when these obsessions begin to overlap? With warmth, humor, and a clever touch, Williams taps into our collective unease about the modern world and allows us see it a little more clearly. It feels so good to have enjoyed a novel so fully that I read it in a day and a half. What had me so keen on the premise of Tell the Machine Goodnight is a) the fact that the synopsis "playfully illuminates our national obsession with positive psychology, our reliance on quick fixes and technology" and b) Gabrielle Zevin, one of my favorite authors who excels with her subtle little quips on our daily lives, blurbed it. Pearl's job is to make people happy. Every day, she provides customers with It feels so good to have enjoyed a novel so fully that I read it in a day and a half. 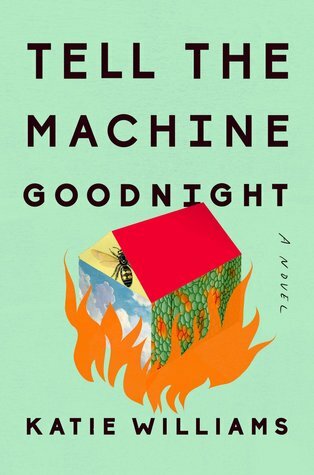 What had me so keen on the premise of Tell the Machine Goodnight is a) the fact that the synopsis "playfully illuminates our national obsession with positive psychology, our reliance on quick fixes and technology" and b) Gabrielle Zevin, one of my favorite authors who excels with her subtle little quips on our daily lives, blurbed it. Pearl's job is to make people happy. Every day, she provides customers with personalized recommendations for greater contentment. She's good at her job, her office manager tells her, successful. But how does one measure an emotion?Meanwhile, there's Pearl's teenage son, Rhett. A sensitive kid who has forged an unconventional path through adolescence, Rhett seems to find greater satisfaction in being unhappy. The very rejection of joy is his own kind of "pursuit of happiness." As his mother, Pearl wants nothing more than to help Rhett--but is it for his sake or for hers? Certainly it would make Pearl happier. Regardless, her son is one person whose emotional life does not fall under the parameters of her job--not as happiness technician, and not as mother, either.Told from an alternating cast of endearing characters from within Pearl and Rhett's world, Tell the Machine Goodnight delivers a smartly moving and entertaining story about relationships and the ways that they can most surprise and define us. Along the way, Katie Williams playfully illuminates our national obsession with positive psychology, our reliance on quick fixes and technology. What happens when these obsessions begin to overlap? With warmth, humor, and a clever touch, Williams taps into our collective unease about the modern world and allows us see it a little more clearly. Thankfully for my impatient temper, the introducing story starts off compelling enough, in particular, hits the spot for me upon introducing Pearl's sixteen-year-old son, Rhett, who's recovering from an eating disorder. His unknowable, remote nature makes for a natural pull in getting to know more about him. Incidentally, he's also all the things that make me feel fond of a character: distant, moody, hates school, rarely leaves his home, is close to his mother (or getting to it).To counter his anguished withdrawal, Pearl's powerless state seeps in, when all she craves is to bring her child back from hovering on the brink, so she channels in her overprotective, overbearing, OVEReverything nature, similar to Joyce Byers in Stranger Things.The following stories move deftly between alternating characters, such as Pearl's ex-husband, Elliot, Pearl's shifty coworker, Carter, Pearl's high-end secret client for Apricity, who gets name-dropped throughout the book so that when we finally meet her it feels like all else has led up to this exact moment. At the heart of it all, though, stands Pearl with her fierce protectiveness (of herself, of her child, of her machine) at her beck and call.Tell the Machine Goodnight gets so many things right by going outside the box not only on the platitudes of motherhood but through the whip-smart writing and a tremendous cast that lead to having numerous moments and turns of phrase to remind me of how good this book can be. Leading examples include:• #1 "unique store-bought personality" is one of the more memorable lines I've read this year.• #2Typically, we’d fill in the brackets on our own, but Katie Williams is here to reminds us not to succumb to gender stereotypes.• Another moment where I felt the author truly shine was with Zihao's introduction (Rhett's college roommate, an international student from China). It takes a special type of writer to succeed at showcasing a character's personality through text messages (and with emoji, no less).• But he truly caught my attention when he got randomly along with Rhett's mom.The subtle ingenuity disposed between Rhett and Zi had me smiling like a fool. • And I'll leave my review with one last riveting insight on something that I'm running over and over in my mind: I love how, throughout my reading experience, this novel remains utterly self-aware and keeps up with the whip-sharp and INNOVATIVE remarks on our deepest desires. And I know I said the above was the last passage I wanted to share, but I have one more subtle quip for the road: "Being home from college for the summer is like sleeping over at a friend's house you've only ever visited in the afternoon. The furniture is familiar, but the light has gone funny on you." ARC kindly provided by the publisher in exchange for an honest review.Publication Date: June 19th, 2018Note: I’m an Amazon Affiliate. If you’re interested in buying Tell the Machine Goodnight, just click on the image below to go through my link. I’ll make a small commission!This review and more can be found on my blog. The first blurb I've written in a while:"Tell the Machine Goodnight is philosophical, funny, cleverly structured, unpredictable. The characters are recognizably humans, but not ones I have met before; the world-building is creative and completely convincing. I doubt I will ever read another novel with a more moving trip up a VR mountain." I really love speculative fiction, so this was right up my alley. Imagine if there were a machine that could tell you exactly what you needed to do to be happier. Pearl works for the creators of Apricity, a device that does exactly that, and spends her days providing people with this coveted advice.Tell the Machine Goodnight is about Pearl and the people who are part of her life: her son, Rhett, who suffers from anorexia and stubbornly embraces his melancholy; her boss, Carter, who manipulates t I really love speculative fiction, so this was right up my alley. Imagine if there were a machine that could tell you exactly what you needed to do to be happier. Pearl works for the creators of Apricity, a device that does exactly that, and spends her days providing people with this coveted advice.Tell the Machine Goodnight is about Pearl and the people who are part of her life: her son, Rhett, who suffers from anorexia and stubbornly embraces his melancholy; her boss, Carter, who manipulates the Apricity into delivering advice to attain power; and Calla Pax, a young celebrity who commissions Pearl to deliver daily Apricity readings. There’s also Pearl’s ex-husband and his new wife, who hide mysterious secrets from each other.The bizarre and fascinating vignettes from each of these characters’ lives make up the narrative of this novel about people trying and failing to find happiness and contentment amid the disconnectedness of modern life. I was thoroughly engaged in each mini storyline, even the ones that felt more disparate and self-contained. This was close to being a 5-star book for me and likely would’ve been if there had been the tiniest bit more closure and cohesiveness in the end. Literary sci-fi/speculative fiction intrigues me, especially when it draws comparisons to episodes of Black Mirror and the Twilight Zone. TELL THE MACHINE GOODNIGHT revolves around a device (called an Apricity) fabricated to deliver “contentment plans” for users, ensuring enduring satisfaction and lifelong joy for those who adhere to the plan. At the center of the drama is Pearl, a technician for the company that administers the Apricity tests, and her son Rhett, a misfit teen hellbent on railin Literary sci-fi/speculative fiction intrigues me, especially when it draws comparisons to episodes of Black Mirror and the Twilight Zone. TELL THE MACHINE GOODNIGHT revolves around a device (called an Apricity) fabricated to deliver “contentment plans” for users, ensuring enduring satisfaction and lifelong joy for those who adhere to the plan. At the center of the drama is Pearl, a technician for the company that administers the Apricity tests, and her son Rhett, a misfit teen hellbent on railing against the hollow happiness Apricity delivers. Told by a revolving cast of characters that include Rhett and Pearl’s friends, family and co-workers, a tale of technological obsession and a search for happiness unspools before us as each grapples with their own fears and desires, finding out what the cost of their own happiness really is.Though the premise grabbed me immediately, too much about this book felt clunky. Williams stretches herself thin by introducing too many characters and having several plot lines and character arcs cut short of fruition. Some chapters even feel like short stories, self-contained and having very little to do with the larger story of the novel. Though we get some kind of closure by the end, this one feels only partially realized. I wouldn’t go so far as to say I *didn’t* like this book, though. There are intriguing ideas here and I appreciated so much of the humor within. When it comes to debut novels, also, I’ll allow for more flaws than with the work of a seasoned author. This is a solid first book and I’d recommend it to those who’ve read and enjoyed the works of Thomas Pierce and Ramona Ausubel. It’s charming, clever, warm and easily digestible. What if you could turn happiness into a consumer product? What if a machine could tell you simple instructions to achieve it? “Eat tangerines,” “Arrange fresh flowers,” “Write poetry.” What if the pursuit of happiness became a guarantee? This theme is explored in Katie Williams’ debut novel, which takes place in 2035. The response from the public, surprisingly, is not unanimous. Sure, there are many individuals clamoring to buy happiness (if they can afford it), but there are people who are skep What if you could turn happiness into a consumer product? What if a machine could tell you simple instructions to achieve it? “Eat tangerines,” “Arrange fresh flowers,” “Write poetry.” What if the pursuit of happiness became a guarantee? This theme is explored in Katie Williams’ debut novel, which takes place in 2035. The response from the public, surprisingly, is not unanimous. Sure, there are many individuals clamoring to buy happiness (if they can afford it), but there are people who are skeptical, others who prefer UNhappiness, and those that would prefer to cultivate it themselves without technological interference. How this plays out, and the effect it has on society, is the substance of this story.The protagonist, Pearl, makes her living as an “Apricity” technician, swiping people’s DNA, inserting it in the machine and reading the resulting recipe for happiness. Her wealthy ex-husband uses it for performance art, and their anorexic son refuses it, on the grounds that he is perfectly content to be unhappy, but uses it to help a friend in trouble. Other, secondary characters play a part in Apricity’s attributes, which raises intriguing questions as the narrative unfolds.It’s hard to pigeonhole this book into a genre, but speculative fiction covers the heart of it, and it quietly, and with a sense of disquiet, tells a tale through interlinked and overlapping stories, or chapters. Williams is a scintillating wordsmith; she creates lucid images and also entices us with her word etymology:“The word for ‘spell,’ as in casting a spell, comes from the same root as the word for ‘narration.’ This is evidence that ancient people believed language to be a sort of magic, the simple act of naming something akin to creating it, controlling it.”These little brilliant gems are peppered through the narrative, as well as passages that genuinely made my skin tingle. It was worth the read just for the succulent language. If you are looking for a book that hurtles inexorably toward a conclusion, to unify all the various threads into closure this is not that book. Ambiguity jettisons completion. I do take minor issue, though, that the end has more features in common with the ending of a chapter rather than a book. Then I read that the author is turning this into a series, which may explain a sort of lackadaisical finish, like a disappearance, as if the characters just walked off stage precipitously. Could the author have been deliberating the series while simultaneously writing the novel? I look forward to viewing the televised version, which may give more decisive action to the characters. However, I feel a certain artifice at work here—i.e. that possibly the outcome had less to do with ambiguity as an intentional novelistic device and more to do with jettisoning it to a different medium—television. 3.75 starsThis review is based on an ARC of Tell the Machine Goodnight which I received courtesy of NetGalley and the publisher (Penguin -- Riverhead). It seems to me that the new novel trend is to write a book with seemingly no purpose, no real plot, and no real point. At least this has been the case with the last few new books I've read, and that seems to be the case as well with Tell the Machine Goodnight. Now, saying this does make me hypocritical, since I always think to myself how I would 3.75 starsThis review is based on an ARC of Tell the Machine Goodnight which I received courtesy of NetGalley and the publisher (Penguin -- Riverhead). It seems to me that the new novel trend is to write a book with seemingly no purpose, no real plot, and no real point. At least this has been the case with the last few new books I've read, and that seems to be the case as well with Tell the Machine Goodnight. Now, saying this does make me hypocritical, since I always think to myself how I would love a realistic story that doesn't have a huge, climaxing finale. So hypocritical I am. I was thoroughly engrossed in this novel, but then, it seemed, that it just suddenly ended. I don't know what to think of the meaning of the plot, other than that it was a neat peek into the lives of a future generation. Regardless of whether I got the deeper meaning or not, I was really fascinated by this story. I was sucked in from the beginning, rushed along, absorbed in Katie Williams storytelling. I really liked the characters, interactions, and the whole idea of the Apricity Machine. I can see this book being a hot topic this publishing season. I also think I sense a new favorite book club book! Perhaps I just missed out on understanding fully what was happening here, but this is just me personally. I definitely recommend you give this a read and see how you feel. Williams' novel is simply put both weird and wonderful. It's set in the near future and is centered around a machine that can give people specific recommendations to make them happier (oh if only this existed!). Although the book is separated into chapters, it actually felt more like linked short stories to me. I loved the odd characters and Williams' writing style is unique and captivating. I'm surprised this one hasn't gotten more love - I'm obsessed with the magical realism tone! I loved this book! It had an original story and lovable, relatable, realistic characters. While some of the reviewers have said the message isn't a particularly strong one, it hit me pretty hard at the end. I thought it was lovely the way it did hit me, because it was more like a "DUH!" and then a bit of feeling like crying because it should be SO obvious, but everything is so chaotic and messy that we forget. I say "Read it!" and I'll cross my fingers it hits you like it did me, cuz it'll make I loved this book! It had an original story and lovable, relatable, realistic characters. While some of the reviewers have said the message isn't a particularly strong one, it hit me pretty hard at the end. I thought it was lovely the way it did hit me, because it was more like a "DUH!" and then a bit of feeling like crying because it should be SO obvious, but everything is so chaotic and messy that we forget. I say "Read it!" and I'll cross my fingers it hits you like it did me, cuz it'll make you smile at yourself in a gentle reprimand for forgetting. I really enjoyed reading this book and getting to know the characters in it. Although I fell like there were some issues with the direction of the plot, I thought it was well written and it definitely kept me interested. Also, I enjoyed the imagining of the future and the creation of a device that with a DNA sample, can tell us what we can do to be happy. Lots to ponder on this one. Like previous literary fiction I’ve read, I learn plenty of trivial information or bits that I pace been curious about but never pursued. This one involves pop psychology, linguistics, with a dash of pop culture. Pearl is an employee for a company that Invented a machine that can tailor happiness recommendations using a person’s DNA (I picture the device looking like those portable printer type). This novel has multiple perspectives with an interesting cast of charact Lots to ponder on this one. Like previous literary fiction I’ve read, I learn plenty of trivial information or bits that I pace been curious about but never pursued. This one involves pop psychology, linguistics, with a dash of pop culture. Pearl is an employee for a company that Invented a machine that can tailor happiness recommendations using a person’s DNA (I picture the device looking like those portable printer type). This novel has multiple perspectives with an interesting cast of characters with their struggles to find happiness. Ascerbic and thorough. I have yet to dissect the ending. Williams explores humanity's search for happiness in 2035 America. Lyrical prose and captivating characters. Beautiful. I won a copy in a Goodreads giveaway.It is a quick, enjoyable read. I liked looking at the idea of technology and happiness. Happiness is different for everyone, some easy tasks and others more complex are given by the machine. The characters are mostly likeable yet still flawed. The ending is a bit abrupt but then I was expecting a fully laid out happy ending to a novel about happiness. I recommend this for anyone looking for a quick read. [Content Warning: This book deals with disordered eating. I'm putting this at the top so that the people who need such a warning can see it, even though it has nothing to do with my review. One of the characters is purposely starving himself, and the book gets into his methods and motivations.] Tell the Machine Goodnight 's central concept--a machine that tells people what to do to be happier--is so rich with potential. The machine's instructions are perfectly specific and unsettling; on page on [Content Warning: This book deals with disordered eating. I'm putting this at the top so that the people who need such a warning can see it, even though it has nothing to do with my review. One of the characters is purposely starving himself, and the book gets into his methods and motivations.] Tell the Machine Goodnight 's central concept--a machine that tells people what to do to be happier--is so rich with potential. The machine's instructions are perfectly specific and unsettling; on page one, a man is told to "eat tangerines on a regular basis, work at a desk that receives morning light, and amputate the uppermost section of his right index finger." This raises several issues: What are people willing to do because a machine promises them happiness? The machine is used in a corporate setting to help employees feel better about a tragedy, which raises issues about how capitalism exploits our emotions in the service of productivity. Of course, there's also a Twilight Zone-esque aspect that what makes one person happier might actually harm others. And what if the machine could be put into service for outcomes other than happiness?These are just the angles that Katie Williams explores in this book; I'd love to see a sequel with a new set of characters exploring other consequences of this machine.As for this book, I loved the concept (obviously), the characters are interesting, and Williams includes tiny mysteries about people's histories and motivations with trust that the reader can figure out what happened without being told outright. I sped through this book because it's so compelling. Yet--when I reached the end, I felt a bit unfulfilled. Some of those mysteries are left unresolved, even as others tie back to the opening. Again, I'd just like to see more of this clever treatment of an intriguing conceit. Absolutely loved this story until the ending. What a disappointing ending! It seemed to just cut off the story unnaturally like Melvin's index finger tip. Apricity is a neat idea. The whole book flowed smoothly and I found myself unable to put it down. Was completely invested in all of the characters and that's why the ending was so disappointing. Can't win them all. This review and other shenanigans are also posted on my book blog.The year is 2035. A machine called Apricity exists. It’s a machine which, from a simple swipe of a person’s DNA, recommends a few to-do stuff that will guarantee happiness. Stuff like: Eat tangerines on a regular basis, work at a desk that receives morning light, amputate the uppermost section of your right index finger. It’s entirely up to the person if he/she will actually do these recommendations but you must know that the Apr This review and other shenanigans are also posted on my book blog.The year is 2035. A machine called Apricity exists. It’s a machine which, from a simple swipe of a person’s DNA, recommends a few to-do stuff that will guarantee happiness. Stuff like: Eat tangerines on a regular basis, work at a desk that receives morning light, amputate the uppermost section of your right index finger. It’s entirely up to the person if he/she will actually do these recommendations but you must know that the Apricity boasts of 99.97% customer’s approval rating. And pertinent to my immersion in the book is that Pearl, an Apricity technician, is a firm believer of the technology.The book follows quite a number of characters: Pearl, the Apricity technician; Elliot, Pearl’s artist ex-husband; Rhett, their teenage son; Carter, Pearl’s boss; Val, Elliot’s new wife; and Calla Pax, a celebrity scream queen. Some PoV are in 1st person while others are in 3rd person. All of them felt lived in characters. I find some of them relatable and some of them understable. Through them, the book dishes a hodgepodge of thoughts on happiness. At one point, Pearl ponders on the pleasure of doing harm to people who hurt her. As time goes by, she becomes more and more obsessed with Apricity and the things that it can do for her. Both Rhett and Val feels unworthy of happiness. Elliot’s art exhibit depicts that too much of a thing that makes you happy can be awful. Carter’s pride is in being a leader and asserting power over his subordinates. And how fame can both be Calla Pax’s source of empowerment and trauma.As far as I’m concerrned, the book has no discernible straightforward theme and plot. At it’s best, it can feel episodic with something about happiness and technology as constants. At it’s worst, it feels scattered with too many thoughts about technology and happiness not coming together at all. The book will leave the PoV of a character then shift to another with things still hanging. And when we meet this character again later on, a lot of time has passed and a lot of stuff has apparently happened off the pages and it’s up to the reader to fill up all those gaps. I know a reader should not be lazy but my reading sensibilities can barely handle this too much blankspace. A bit more of details wouln’t hurt so the development of the plot and these characters would not feel shortchanged.Still, I’m glad I finished the book. The writing is of quality that makes me read and set aside my qualms. It actually made me agree with most of the points it is trying to say. Like how we rely heavily on technology (in our case, smartphones) for almost everything, including happiness. And like how despite the existence of technology which can supposedly make us happy, we are still never truly happy. And sometimes happiness is not pursued, but will come at you in the most unexpected of times and places. Or how sometimes the path to happiness is faking it until you make it, like climbing a virtual reality mountain with its fake mountaintop and fake blue skies. Now that I’m finally all moved, I’m getting around to reading a lot of galleys that I’m late on & have had for forever. The first one I read was Tell the Machine Goodnight by Kate Williams. The story follows several people in a future where a machine can tell you what will make you happy for the right price. Pearl, a technician who can use the machine for others, seems to enjoy her job, but is dumbfounded by her son, Rhett, who seems to want to remain unhappy.Content Warning: eating disorder Now that I’m finally all moved, I’m getting around to reading a lot of galleys that I’m late on & have had for forever. The first one I read was Tell the Machine Goodnight by Kate Williams. The story follows several people in a future where a machine can tell you what will make you happy for the right price. Pearl, a technician who can use the machine for others, seems to enjoy her job, but is dumbfounded by her son, Rhett, who seems to want to remain unhappy.Content Warning: eating disorders, mental illness, assault, self-harmI enjoyed this novel, though it felt a bit disjointed to me. It’s told in chapters from alternating perspectives from varying characters. The stories interlock and overlap, and all explore ideas related to happiness. There’s an air of absurdity to the novel as well. Pearl is a likable character, though sometimes she makes choices I find questionable–but who doesn’t? Her son is also intriguing and I appreciated the chapter from his point of view. The disjointed nature of the novel meant some threads were explored and never picked back up, but overall, I felt like there was a cohesive narrative, even if there wasn’t a traditional story arc.The future depicted in the world was intriguing to me. The Apricity machine, which is supposed to give recommendations for happiness, was very interesting. It provides seemingly random recommendations based on your DNA, and it felt very satirical at times, and is a tacit presence throughout the stories. It aids and hurts, but is a constant in each person’s story. The novel does tackle a lot of big issues through this machine, including our reliance on sources outside ourselves to tell us what our lives are missing, the notion of celebrity, and how family dynamics are affected by outside forces.Overall, this was a solid slice-of-life read. The characters were interesting and the future depicted was likewise fascinating. I enjoyed it, and I liked the way the chapters read. If you like near future books with interesting concepts, you’ll likely enjoy this as well.Note: I received this book from Netgalley and the publisher in exchange for a fair and honest review. Thank you to Edelweiss+ for this Advanced eGalley of Tell The Machine Goodnight. Pearl works for Apricity, a company known for being able to guide people towards what will make them “happy” via their Apricity machine. Pearl believes in the results the Apricity machine often provides, and has used its “contentment plan” as a way of balancing her own life. Inasmuch as Pearl believes in the machine, her personal life is surrounded by unhappiness. Her 16-year old son (Rhett) is recovering from an ea Thank you to Edelweiss+ for this Advanced eGalley of Tell The Machine Goodnight. Pearl works for Apricity, a company known for being able to guide people towards what will make them “happy” via their Apricity machine. Pearl believes in the results the Apricity machine often provides, and has used its “contentment plan” as a way of balancing her own life. Inasmuch as Pearl believes in the machine, her personal life is surrounded by unhappiness. Her 16-year old son (Rhett) is recovering from an eating disorder, and rarely speaks to her, unless she pushes him to do so. The story initially focuses on her need to find what will make him happy, so he can get “better”. Unfortunately, her son won’t allow her to use the machine on him. Pearl, however, has other plans. From there, the book veers and detours into the lives of those connected to Pearl—both directly and indirectly. There’s Calla Pax (a young actress with a signature voice), Elliott (Pearls ex-husband), the aforementioned Rhett, Carter (Pearl’s co-worker and confidant), and Valeria (Elliott’s young wife). Each are trying to figure out how to live their lives in a way that will make them happy; most of them have no idea where to begin. In the end, as a reader, you’re likely to feel no closer to a resolution, for them, than you were at the start. But, you’ll learn a bit from the unlikely missteps the characters endure—each of whom still manage to grow. Albeit in minute, but arguably significant, ways. The book focuses on two questions: 1) Can happiness be defined? and, if yes, then 2) Is it something we should be trying to quantifiably measure?This book is definitely not for everyone. It can be a bit confusing, and the pacing is measured and, at times, a bit slow. Plus, I’ll be honest, these are some weird people. That said, I enjoyed it more than I thought I would, and found it thought-provoking in more ways than one. This book was not what I expected.I expected another one of those dystopian novels where everything seems too good to be true and then goes terribly wrong; Tell the Machine Goodnight is not that.The story explores the lives of several characters centred around our protagonist Pearl, who is an Apricity technician. Apricity is a machine that analyses your DNA and makes recommendations to achieve more happiness – they can be as small as eating more oranges, or smiling at your wife, or larger like c This book was not what I expected.I expected another one of those dystopian novels where everything seems too good to be true and then goes terribly wrong; Tell the Machine Goodnight is not that.The story explores the lives of several characters centred around our protagonist Pearl, who is an Apricity technician. Apricity is a machine that analyses your DNA and makes recommendations to achieve more happiness – they can be as small as eating more oranges, or smiling at your wife, or larger like cutting off part of your finger. It's less about achieving ultimate happiness and more about living a more content life.This book feels more like an exploration of an idea than a fully fledged story, which is okay with me. Because, what if? What if a machine could tell you how to achieve happiness? Would this change society, and how? Or are we too human to ever be really happy? And how many different uses can this technology have? Is it suited for all of them?I enjoyed this book. It's a well-written and engaging read that explores the complexities of being human. I just wish I'd been able to connect with any of the characters more; there was something missing about all of them that prevented me from fully caring about them; maybe cutting some of the stories and exploring fewer lives would have helped this. Received an advanced copy in exchange for a fair review.Tell the Machine Goodnight was engaging early and kept me reading, but only because I kept hoping we would shift back to POVs and storylines which we often didn't, making for a frustrating experience overall. The premise is begging to be referred to as a series of Black Mirror episodes (so I'll make the reference): it's set approximately 20 years in the future where a company has created technology that can scan your DNA and give you a list Received an advanced copy in exchange for a fair review.Tell the Machine Goodnight was engaging early and kept me reading, but only because I kept hoping we would shift back to POVs and storylines which we often didn't, making for a frustrating experience overall. The premise is begging to be referred to as a series of Black Mirror episodes (so I'll make the reference): it's set approximately 20 years in the future where a company has created technology that can scan your DNA and give you a list of things to do that will make you happier. The character we meet first and spend the most time with is Pearl, who works at this company. We shift perspectives to her son, coworker, ex-husband... then about two-thirds of the way through, we've had a time jump of months and Pearl is going to personally consult with a famous actress and gets caught up in her life.As the story spins out to more and more characters, we return to the core ones less and there were unresolved storylines by the time we did return to just pick up with their lives and not address what has happened since we last saw them. It really was like Williams wanted to explore so many kinds of stories she ended up stringing together a bunch of vignettes in the same universe, but it just didn't work for me. My feeling is that "Tell the Machine Goodnight" is more a collection of short stories around a family and people that have a connection to them. The chapters/stories show change with all the characters, but I wouldn't necessarily call it growth.I enjoyed the book. It had great ideas and great language. It was not what I was expecting though.Rhett was an interesting character, and the change from angsty teen to young adult was done very well over a couple of the chapters. The changes in Pearl as My feeling is that "Tell the Machine Goodnight" is more a collection of short stories around a family and people that have a connection to them. The chapters/stories show change with all the characters, but I wouldn't necessarily call it growth.I enjoyed the book. It had great ideas and great language. It was not what I was expecting though.Rhett was an interesting character, and the change from angsty teen to young adult was done very well over a couple of the chapters. The changes in Pearl as she deals with divorce, loneliness when Rhett goes to school, and the changes in career over the meeting of a popular actress are real and creepy. The Apricity machine is a great idea for driving the stories and becomes a character all its own by the end.I missed the common overall arc of beginning, middle, and end of a larger story, but I do enjoy the sort of daily life story in this and other "modern" writing. I enjoyed theorizing that maybe Pearl has become an unreliable narrator by the end and maybe the story doesn't end the way we see. This idea comes from the relationship between Pearl and the Apricity machine, but it is not hinted or mentioned in the text.I received a free ARC of this book through Goodreads' Giveaways. What drew me to the book was the intriguing title and front cover. Then I read the bio and knew that I had to read this book. Pearls job is to make people happy. Everyday she provides customers with personalised recommendations for greater contentment. She is fantastic at her job and is one of the best employees that they have. Weaving masterpieces with the apricity machine. But how does anyone truely measure an emotion. Meanwhile Pearls son Rhett a sensitive and troubled child finds it easier t What drew me to the book was the intriguing title and front cover. Then I read the bio and knew that I had to read this book. Pearls job is to make people happy. Everyday she provides customers with personalised recommendations for greater contentment. She is fantastic at her job and is one of the best employees that they have. Weaving masterpieces with the apricity machine. But how does anyone truely measure an emotion. Meanwhile Pearls son Rhett a sensitive and troubled child finds it easier to be unhappy and suffers with eating and fitting in with the world. Pearl is doing the best job that she can but there is a fine line between being helpful and overbearing. What’s the best way to deal with Rhetts problems? And will they ever be able to get him on the straight and narrow again. This book pulls you in from the very start, with endearing characters that you come to care about, it is a unique and quirky book that captures life and peoples emotions impeccably. There are so many different layers to this book that keeps you gripped all the way through. It’s a heart warming read, with multiple layers, all told in a caring and sensitive way. For me this book really hit the mark and I absolutely loved it. Fabulous. Happiness may be fleeting and difficult to quantify, but it can be achievable in so many different ways, as dictated by a machine providing personalized plans in Tell the Machine Goodnight by Katie Williams.To read this, and other book reviews, visit my website: http://makinggoodstories.wordpress.com/.Pearl is an Apricity technician, running tests on the machine for people in order to generate their personalized contentment plans to help them achieve a greater level of happiness in their lives. Happiness may be fleeting and difficult to quantify, but it can be achievable in so many different ways, as dictated by a machine providing personalized plans in Tell the Machine Goodnight by Katie Williams.To read this, and other book reviews, visit my website: http://makinggoodstories.wordpress.com/.Pearl is an Apricity technician, running tests on the machine for people in order to generate their personalized contentment plans to help them achieve a greater level of happiness in their lives. But just because Pearl is able to provide others with potential ways to increase their happiness doesn't mean that she's actually capable of helping her teenage son Rhett, despite how much she may desire to. Rhett, suffering from an eating disorder and reluctant to confide in his mother, seems to revel in unhappiness, but as this seems to bring him some joy, does that not mean that he's found an alternate way to his own happiness that's not dependent upon a machine prescribing it to him?An intriguing premise, which creepily doesn't seem too horribly far-fetched, this story easily captured my attention and kept me captivated. As society seems to place an emphasis on ways to quickly improve our lives, this story reflects the (unrealistic) importance we place upon categorizing and measuring our enjoyment of life. Told through multiple perspectives of rather complex characters, including those tangential to Pearl and Rhett, the world and relationships presented is relatively well-explored as it offers a glimpse into how technology both enhances and hinders human contentment. Each perspective shared provides a new layer from which to think about the premise presented and the narrative as a whole; however, I found that introducing the voices of this many characters had a short story feel to them, which prevented the novel, and the two characters who were the primary focus from the novel's synopsis, from being fully realized. *I received a copy of this book through a Literary Hub giveaway.